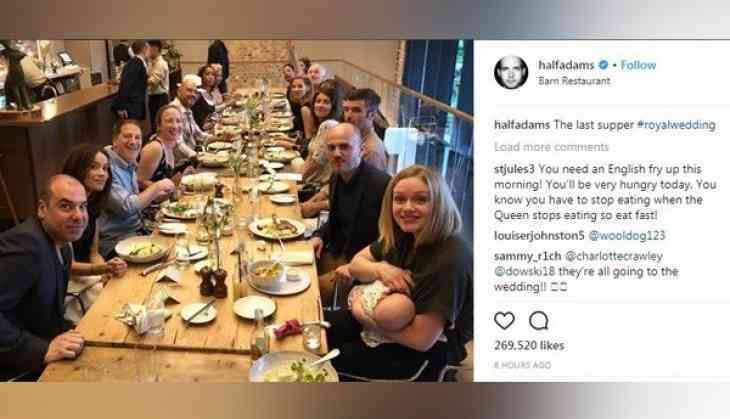 A day before the royal wedding, Meghan Markel's 'Suits' team enjoyed a meal together and wished her all the luck in the new journey she is about to embark. Her co-star and on-screen husband Patrick J. Adams on Friday shared a lovely picture on Instagram of castmates Rick Hoffman, Gina Torres, Sarah Rafferty and Abigail Spencer all enjoying a meal at the Barn Restaurant. He wrote,"The last supper #royalwedding." The Canadian actor also took to Twitter to wish bride-to-be as he wrote," Going to bed now and thinking a lot about the strange surreal and wonderful day my friend Meghan is going to have tomorrow. Meghan - wherever you are - we are so grateful to be here to watch you both take this monumental step together. Love deeply and live well. #RoyalWedding." The Royal Wedding will take place today at the Windsor Castle.